As Los Cabos photographers specializing in luxury destination weddings, we are often spoiled with incredible five-star locations. Such was the case at this Las Ventanas al Paraiso wedding in San Jose del cabo, Mexico. The bridal prep took place in one of the Rosewood resort's oceanfront three bedroom villas - 3600 square feet of air-conditioned loveliness, a private infinity pool overlooking the Sea of Cortes, and a master bathroom bigger than most Brooklyn apartments. One of our goals as destination wedding photographers is to imbue our couples' wedding day coverage with a sense of 'place'. After all, every couple chooses their location for a reason & it is our job to capture the essence of that location - be it Cabo, Cancun, or Cuba. In this case, the bride & groom had vacationed at Las Ventanas every year since they first met, and they wanted to share this special place with 70 of their closest family & friends. 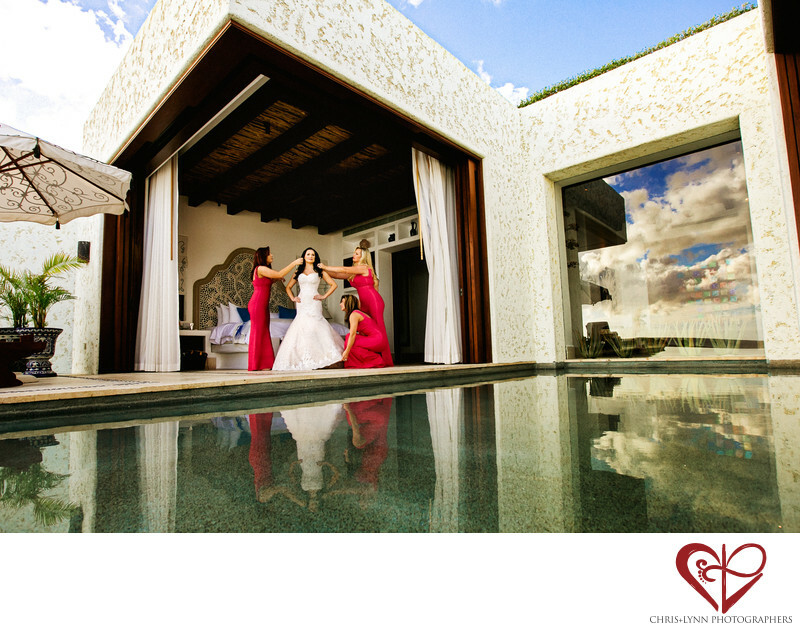 For this image of the beautiful bride getting into her dress with the help of her bridesmaids, Chris lay on his stomach on the deck at the other side of the pool in order to capture the luxurious spaciousness of the oceanfront villa. A beautiful image of the bride and her closest friends that also captures a bit of the grandeur of Las Ventanas al Paraiso.